Credit Sesame is a website that can give you a free credit score and find you lower interest rates on your home loan and consumer debt. I first heard about Credit Sesame because of the free credit score they offer but after trying it out discovered that’s only part of their approach to reducing debt. Credit Sesame actually uses your credit score and your debt profile to search for loans you could qualify for that would save you money compared to your current loan. 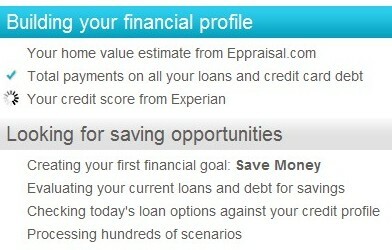 For example, here’s the summary page it gave me after I created my profile and it searched for loans. “Our founders spent years developing the analytics banks use to make their lending decisions. Drawing on this banking industry expertise, they partnered with Berkeley and Stanford scientists to give you access to bank-level analytics — and help you choose loan options that are right for you. There are other services out there that let you search through available loans but the difference with Credit Sesame is that they screen them using your debt profile, so they only find loans that you qualify for and that are at a lower interest rate than what you’re currently paying. Of course, the whole idea is that with lower interest and lower payments you can pay your debt off faster. In order to use your credit score and your current debt levels in it’s search, you have to create a profile of your financial situation. You enter your SSN so Credit Sesame can pull your Experian credit score and validate your credit data. Once it’s setup, the software monitors for changes in your credit score and for any new loans that may be available as a result that could save you money. When you signup for the free service you can go the simple route, like I did, and let Credit Sesame pull in all your debt information from your credit report. You can also manually enter in the principal balance, interest rate, and loan term for your debts. The software uses the loan information to determine your debt ratio – which they use when screening for other loans. For example, mine found our current mortgage and all our credit cards. It also pulls in real estate information from Eppraisal.com if you own a home – the estimated property values do seem a little high. Most anywhere else you look online you have to pay for your credit score and pay for credit monitoring so of course I aked how Credit Sesame can offer it for free. Basically, Credit Sesame’s goal is to find you a loan with a lower interest rate that you qualify for that will save you money on your monthly payments. If you apply for the loan and are approved, then Credit Sesame gets a refferal fee from the bank – which is why they can offer the credit score and software for free to consumers. Overall, it seems like a pretty useful tool and gives you a lot of information in a snapshot view about your credit rating and debt. Even if you don’t end up getting a new loan, it’s a good overview and a free credit score, so check it out – Credit Sesame.